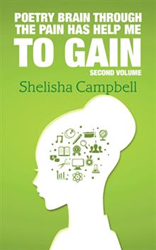 Since she was a little girl, Shelisha Campbell loves to write. Writing has become her therapy. It is her way to vent and change her negative vibes into positive vibes. It also inspired her in writing “Poetry Brain Through the Pain Has Help Me to Gain,” (published by AuthorHouse) her poetic work published in September of 2015. Diagnosed with schizophrenia, Bipolar 1, major depression and anxiety issues as well as a single mother to her three children with Attention Deficit Hyperactivity Disorder (ADHD), Campbell in this book shares her innermost emotion by expressing her everyday life through poetry. Yesterday, I was so stressed. Tomorrow I will be so blessed, because I will pass the stress test. I had to pass it to get to my best. Think about the positive that life has to bring. Shelisha Campbell is a 33-year-old woman and mother of three children.